Be the first to share your favorite memory, photo or story of Brownie. This memorial page is dedicated for family, friends and future generations to celebrate the life of their loved one. 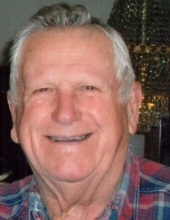 Brownie Wesley Hayes, age 92, of Amissville, VA passed away at his home Wednesday, January 30, 2019 following an extended illness. He was born July 20, 1926 in Wise County, VA. He was in the Army Corp of Engineers serving in WWII. He enjoyed hunting, farming, gardening, auto racing, and bird watching. He was the last surviving member of his immediate family. Mr. Hayes was preceded in death by his parents, Melvin and Martha McCoy Hayes; his wife, Hattie Sue Clayborne Hayes; 6 brothers and 3 sisters; great-grandson, Shane Tapscott. He is survived by his children, Shelia Lynn Whorton and husband Gary of Amissville, VA, Sharon Watts and husband Douglas of Boyce, VA, Bruce Wesley Hayes and wife Mary of Catlett, VA, Joyce Hayes of Augusta, WV, Lois Hayes of Amissville, VA and Angela Hayes of Warsaw, VA; 22 grandchildren; 33 great-grandchildren; several nieces and nephews also survive. Funeral Services will be conducted at 1:00 P.M. Saturday, February 2, 2019 at the Singleton Funeral Service Chapel in Cedar Bluff, VA with Rev. L.D. Savage, and grandson, Rev. Benjamin Whorton officiating. The family will receive friends after 12 noon prior to the Funeral Service. Burial will follow in Greenhills Memory Gardens at Claypool Hill, VA. Military graveside rites will be conducted by Casey-Short VFW Post 9640. Pallbearers will be Benjamin Whorton, Joshua Watts, Alvin Douglas Williams, Amanda Hayes, Douglas Watts, Caleb Landis, Jacob Landis, and Ashleigh Tremmel. Online condolences may be sent to the family by going to www.SingletonFuneralService.com. The family of Brownie Hayes is in the care of Singleton Funeral Service in Cedar Bluff, VA.
To send flowers or a remembrance gift to the family of Brownie Wesley Hayes, please visit our Tribute Store. "Email Address" would like to share the life celebration of Brownie Wesley Hayes. Click on the "link" to go to share a favorite memory or leave a condolence message for the family.